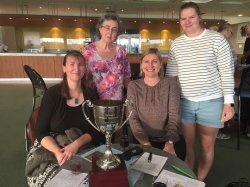 Breaking news is the New Zealand success at the Spring Nationals in Sydney including our local international duo – from left Jenna and Christine Gibbons who paired with Steph Jacob and Rebecca Johnston from Auckland to take out the Women’s Team event. Waikato Bays’ Successes at the National Congress. Unless you have just jetted in from off-shore, it is not really news that the biggest event on the Waikato Bays calendar is the NZ Congress. It was great to see Alan Turner receiving his life membership to NZ Bridge alongside Robin Young, and Ken Yule from Matamata receiving his Gold Grand Master certificate during the presentations. 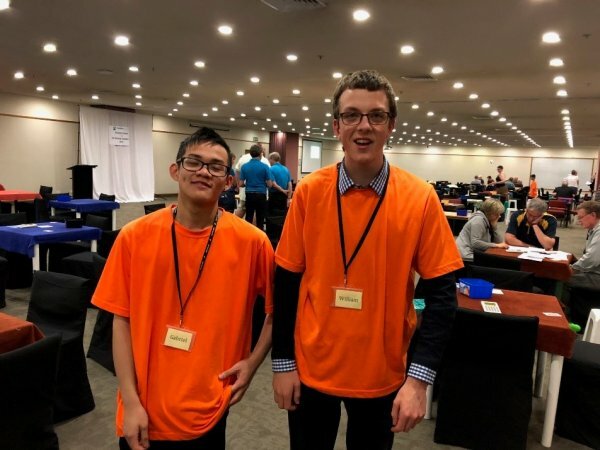 The accumulation of A points during the Congress also pushed Herman Yuan (Cambridge) and Ian Bond (Matamata) over the line to achieve their Grand Master status. Ian and Pam Moore (Rotorua) teamed up with Ian Clayton (Hamilton) and Noel Woodhall (Napier) to come 2nd in the Senior Teams. Charlotte Jager and Anne Leighton (Te Aroha) placed second in the Intermediate Swiss ahead of Mary Girvin and Judith Waldvogel (Te Puke/Tauranga) who were in third place. You may have seen these two at Congress … Gabriel and William from the Waikato club. According to good authority (ie themselves) they are the youngest directors in the country having qualified after sitting the July director’s exam… a pretty impressive feat for these lads who haven’t been playing bridge for that long … actually a pretty impressive feat for anybody who has been playing bridge for a long time also! Wonder how long before their orange caddy shirts become the blue polo’s of the Congress directing team? Hugh McGann recently arrived from Ireland to reside in Hamilton and was partnered with our great Michael Ware … In the acceptance speech after winning the 15A pairs Hugh mentioned that is was normal to play a maximum of 48 boards per day in a full day of bridge in Europe … while he might have been shell shocked by the end of three full days which included 81 boards on Saturday and 72 on Sunday.… at least he didn’t have to tackle the holiday traffic on the way home to Auckland on the final day. 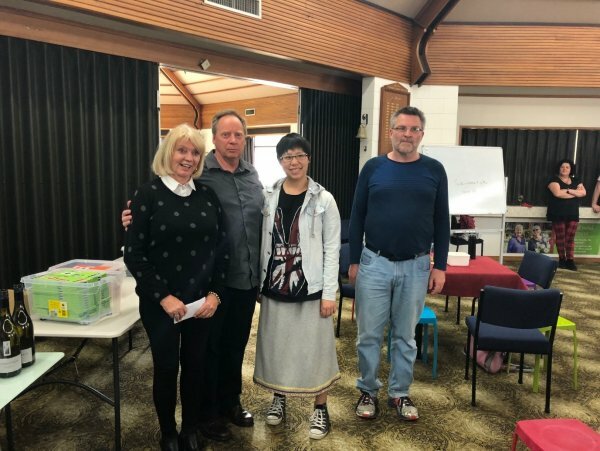 The overall winners of the 10A Congress teams were new Gold GM Jan Cormack, Malcolm Mayer, Claire Miao (all from Auckland) and Wayne Burrows from Palmerston North. 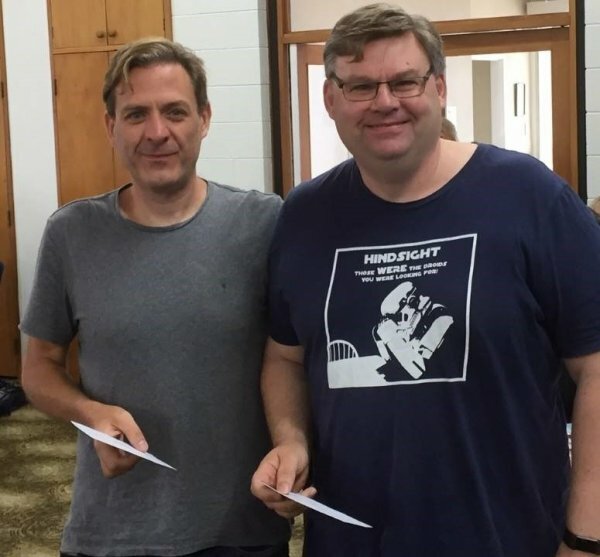 Other winners at the weekend included Michael Curry and Owen Camp from Auckland who won the Consolation Swiss and Terry Wells and Phil Thompson of Hamilton won the Intermediate Pairs. The other winners were all those who stayed for the prizegiving and got to enjoy Kay Dixon’s chocolate eclairs! Forgot to take a photo unfortunately but rest assured they were large and chocolatey. Each year, the Waikato Bays run a league for Intermediate and Junior players which was established several years ago to encourage participation in these tournaments. The deal is that points are awarded for each nominated tournament. Participants are awarded one point for participating, one point for getting over 50% in a session and additional points for placing in an event. 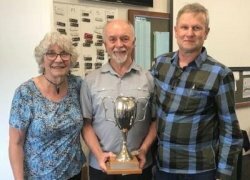 After 9 events in the intermediate league, the winners (which were decided after the Cambridge Intermediate) were Eunice Eccles (our regional RBM from Cambridge) with Malcolm Kirkby (Te Aroha) shown here flanking Mike Neels from the Waikato Bays committee. In the Junior field, we had a four-way tie for first prize. Mike and Angela Newton from Tauranga did enough on the day at Te Awamutu to edge up to first equal with Megan Jolly and Janice Wilton from Hamilton (the winners seen here again flanking Mike Neels from the Waikato Bays committee – he really works hard for the region!) Don McPherson and Richard Wagstaff from Hamilton were the overall winners on the day at the Te Awamutu Junior tournament. 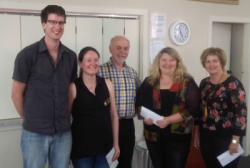 In other news – a couple of Waikato Bay representatives travelled to Whitianga to play bridge and meet the committee at the unaffiliated Mercury Bay club. The Coromandel has 6 clubs that are unaffiliated to NZ Bridge and all within relative geographical proximity; Mercury Bay (Whitianga), Tairua, Pauanui, Whangamata, Hahei and Coromandel.The standard of bridge was good, facilities comfortable and good number of tables playing with a good vibe in the room. We hope that over time we can demonstrate the value of belonging to NZ Bridge and how their members will benefit through having a stronger sport and bridge community but it’s not necessarily a straightforward proposition for some clubs!